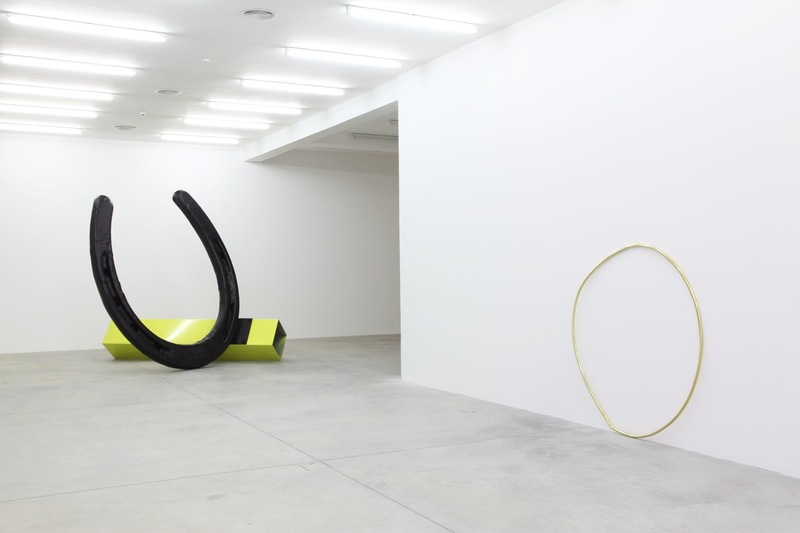 In conjunction with Artissima 2013, Galleria Franco Noero is pleased to present Capricorno, the second solo exhibition in Turin of works by Mark Handforth. Handforthʼs medium-sized and large-format sculptures and installations make constant reference to the urban landscape and to clearly familiar elements within it, to its essential features, which come to mind and which are immediately recognisable. The total transformation and distortion of the scale and proportions of these elements creates a powerful energy within the sculptures, pervading the entire space. It forms narrative itineraries of great tension between opposing concepts, geometric and free forms, the idea of space and the flow of time, the concepts of immanence and change, of the artificial and natural, of abstraction and symbolic representation. Light and its immaterial qualities are often an essential medium in Handforthʼs works, highlighting the contrast of “weight” between it and the other elements they are made of, and substantially transforming the way we perceive them. 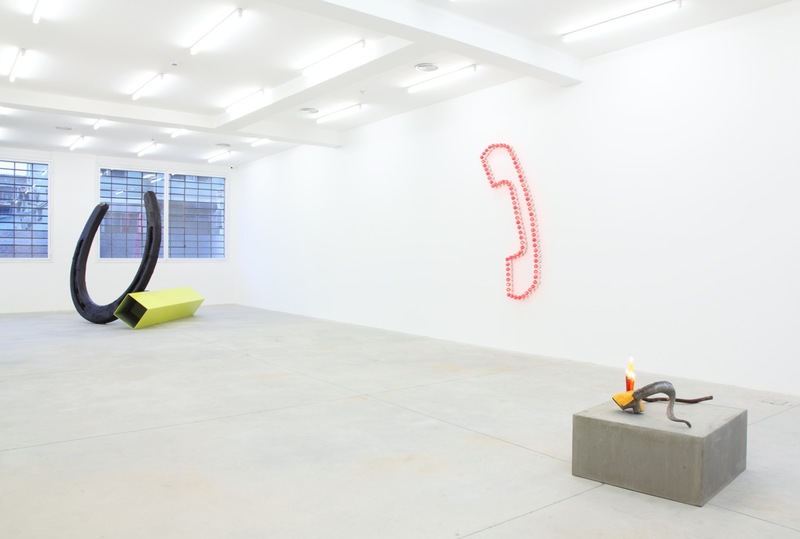 The artist uses both the colder artificial light of neon – the most similar to daylight – and the warmer, more immersive light of coloured bulbs and candles, which become an integral, ever-changing part of his works. As the candles melt, they gradually change their appearance and that of the objects around them. In the artistʼs vision, the corpus of works made for the exhibition in Turin can be viewed as a “hall of symbols” – the spiral, star, cross, horseshoe, circle, the outline of a telephone handset, and wooden bench planks – constituting a set of signs and distinctive forms that concern our everyday lives. In order to act as such, symbols are communicated “neutrally”, with maximum objectivity and minimum subjectivity. These symbols are to be understood freely – for this is what Handforth is interested in – and they are to be read poetically. Far from representing any rules and restrictions, they form the basis on which a flow of associations and thoughts can be built. 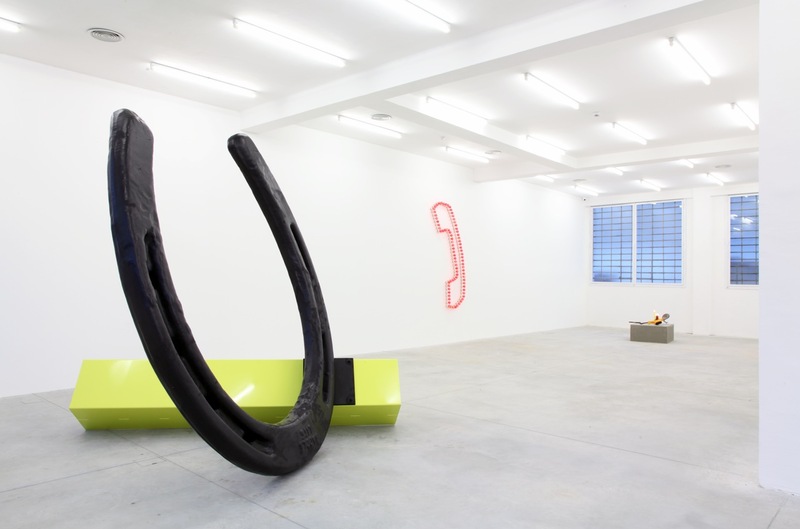 Peregrine appears at the centre of the exhibition space, beneath the skylight, almost like a fallen bird, a broken neck, or a vast flailing wing, playing on the ambiguity of the curved, inverted and magnified shapes of a brass coat hanger. Capricorno is a word that mentally outlines the name of a constellation, but it also suggests the curve of a goatʼs horns, giving its name to some of the sculptures on display. Metal horns become twisted extensions of the handlebars of a Vespa, or a symbolic form with rays extending out from a central hub towards infinity, a star, like the I Capricorn, made of surprisingly bent black metal girders and neon light. 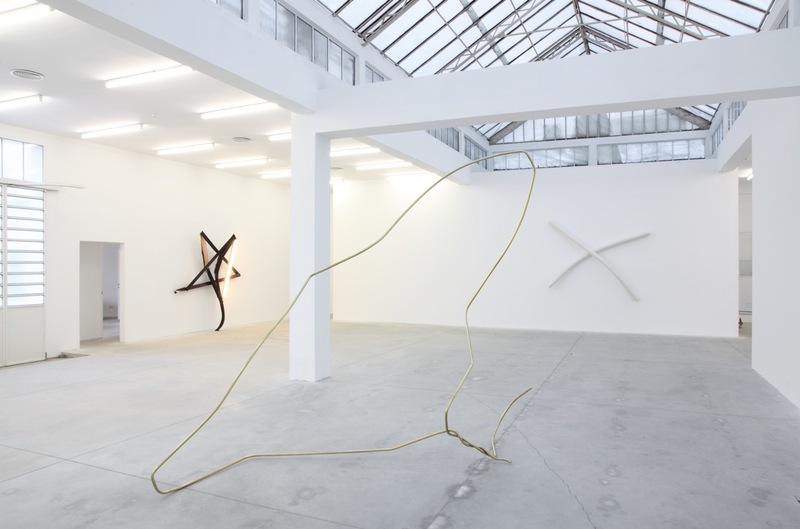 Noodles forms a large, flexing cross floating on the wall: the proportions of the two crossed “spaghetti” that compose it are so out of scale that it is hard to recognise it. As the artist says, it “becomes abstract form and lives on in the half-world between reality and formality”. The artistʼs interpretation of the perfect symbol which is the circle, Golden Ring is a muscular, powerful sign. 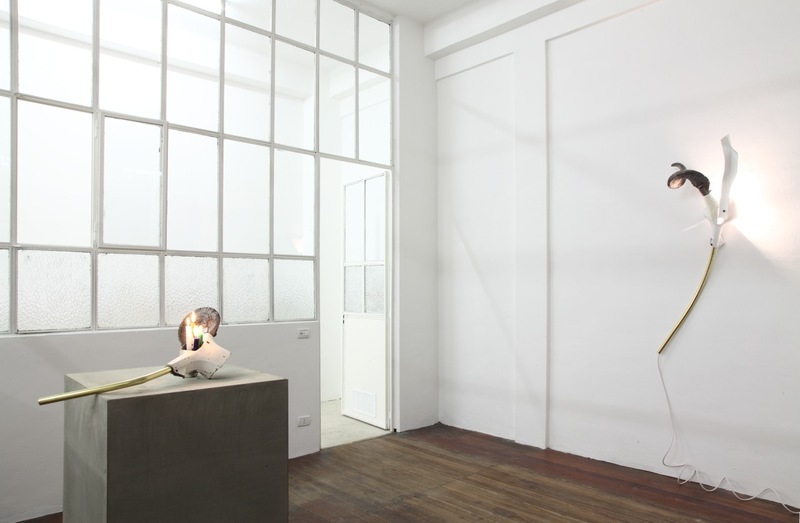 It is reshaped using a flexible material, brass, to create an object that bears the marks of his hand, surrounding a “beautiful nothing”, a portal to elsewhere. 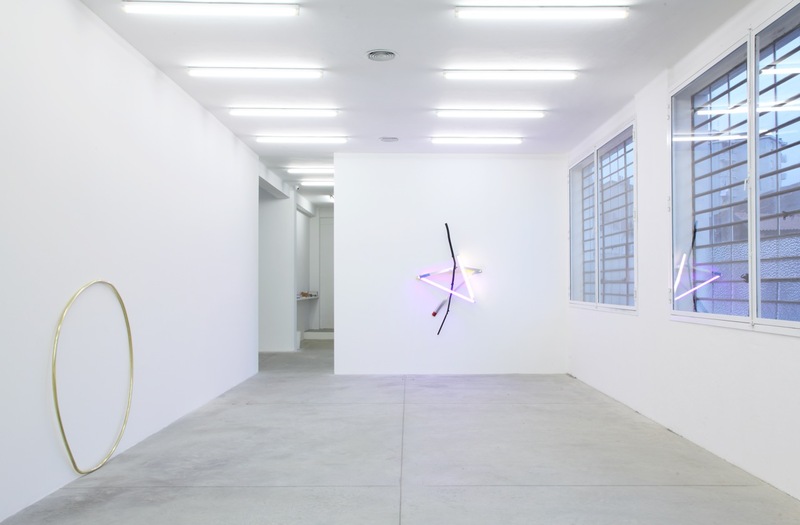 The shadow of the light painted on the wall, the neon light itself, and the organic forms of a branch flowing into the rigid shapes of a metal tube, confuse the reading of background and foreground in another star-shaped composition. It can also be seen in the stylised graphics of a telephone handset that appears on the wall in the form of a continuous sequence of red bulbs, the immaterial colour of which reverberates, making the light almost tangible in the space. The Horseshoes, on the other hand, convey a sense of monumentality with the lightest touch. Shaped like small paper cut-outs in a composition that appears as simple as a collage, they fight against the heavy natural weight of the metal, creating a bold monument to the symbolic memory of superstition. The potential for encounter and the metaphorical expression of a social hub and of meeting are clearly suggested by the uninterrupted extension of three extremely long wooden planks – two in natural colours, and a central one in cobalt blue – which form the seat of a bench made to a design by the artist. A recurrent element in his work, it once again captures the need for a conversation on form that tends towards the abstract, but which maintains the qualities of a representation of reality rather than any escape from it. Mark Handforth (Hong Kong, 1969) lives and works in Miami, USA. He has shown his work in numerous solo and group exhibitions in the United States and Europe, in public and private institutions. These include the solo shows Rolling Stop, Museum of Contemporary Art, North Miami, Miami, FL and the MCA Chicago Plaza Project: Mark Handforth, Museum of Contemporary Art, Chicago, IL (2011), Concentrations 51: Mark Handforth, Dallas Museum of Art, Dallas, TX (2007), Stroom, Den Haag, Holland, and Kunsthaus Zürich, Zurich (2005). Group exhibitions include: Retour du monde, a public urban transport commission, Musée d’Art Moderne et Contemporain, Geneva, CH, and Marseille-Provence 2013, Place François Villon, Aix en Provence (2013), Luminale Midwest: Sunlight on Cold Water, Kunsthalle Detroit, Detroit, MI, and Hors les Murs, FIAC Jardin des Tuileries, Paris (2012), Mapping the Studio: Artists from the François Pinault Collection, Palazzo Grassi/Punta della Dogana, Venice (2009), Château de Tokyo/Tokyo, Redux, CIAP, Ile de Vassivière, France (2008), The Uncertainty of Objects and Ideas, Hirshhorn Museum and Sculpture Garden, Washington DC, and 5 Milliards d’Années, Palais de Tokyo, Paris (2006), Terminal 5, JFK Airport, New York (2004). 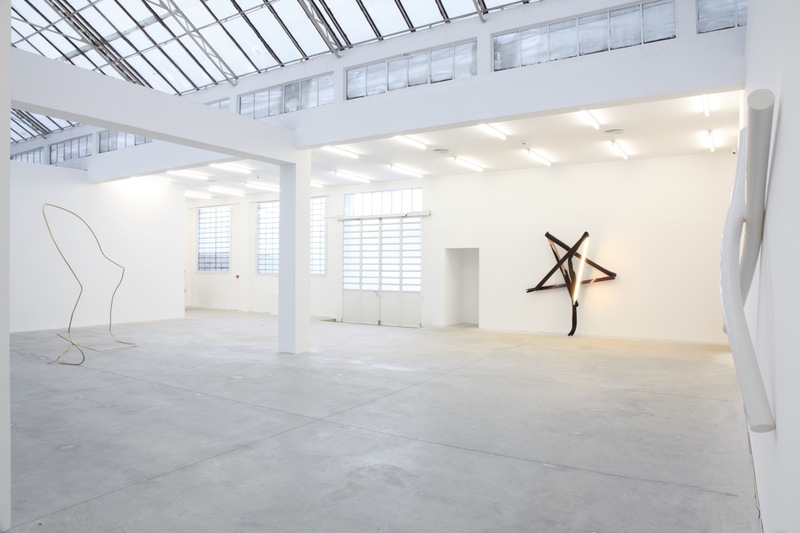 Mark Handforth is represented in Italy by Galleria Franco Noero, Turin.